Symptoms of myocardial infarction (MI) may have been missed in many patients admitted to hospital, according to a study on all heart attack hospital admissions and deaths in England. The authors, from Imperial College London, say more research is urgently needed to establish whether it is possible to predict the risk of fatal MI in patients for whom this condition was not recorded as the main reason for hospital admission. 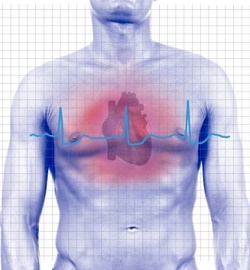 The classic symptoms of heart attack may be subtle or even absent in some cases of MI, which may therefore be missed or overlooked. In this study, the researchers examined records of all 446,744 NHS hospital stays in England between 2006 and 2010 that recorded MI, as well as the hospitalisation history of all 135,950 MI deaths. The records included whether or not patients who died of a heart attack had been admitted to hospital in the previous four weeks and if so, whether signs of MI were recorded as the primary diagnosis, secondary diagnosis, or not recorded at all. One in six (16%) of the patients who died from heart attack had been hospitalised during the previous four weeks, but symptoms of MI were not mentioned on their hospital records. These results suggest that possible signs of upcoming fatal heart attack may have been missed, say the authors. Further research is planned to look into why this pattern emerged, and to try to prevent more cases of fatal MI. For more information visit The Lancet.